Very fast to make! About 10 mins. Hurray! Heavy-based saucepan (ceramic or glass is best), sugar thermometre (optional), small plate, sieve, jam jar – sterilise your jar by rinsing in boiling water then place on a baking tray in a low oven at 80°C (fan) or 100°C (static) for 20 minutes. 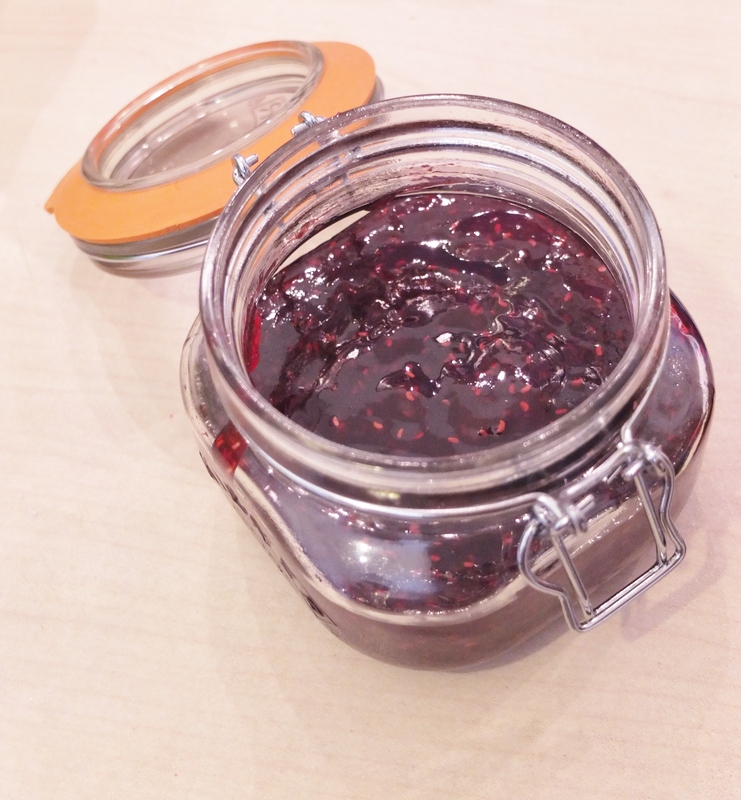 You can play around with the quantities and use any red berries, but too little sugar will give you runny jam. Xylitol (a sugar substitute) produced a strange-tasting gooey opaque..um.. thing. Very sad. So maybe stick to sugar and eat small quantities. Preparation: put a little plate into the freezer. 1. Mash the raspberries, with lemon juice added, in a saucepan and cook for 5 minutes over low heat. Press it through a sieve into a bowl, stirring and squashing well to get the juice out. 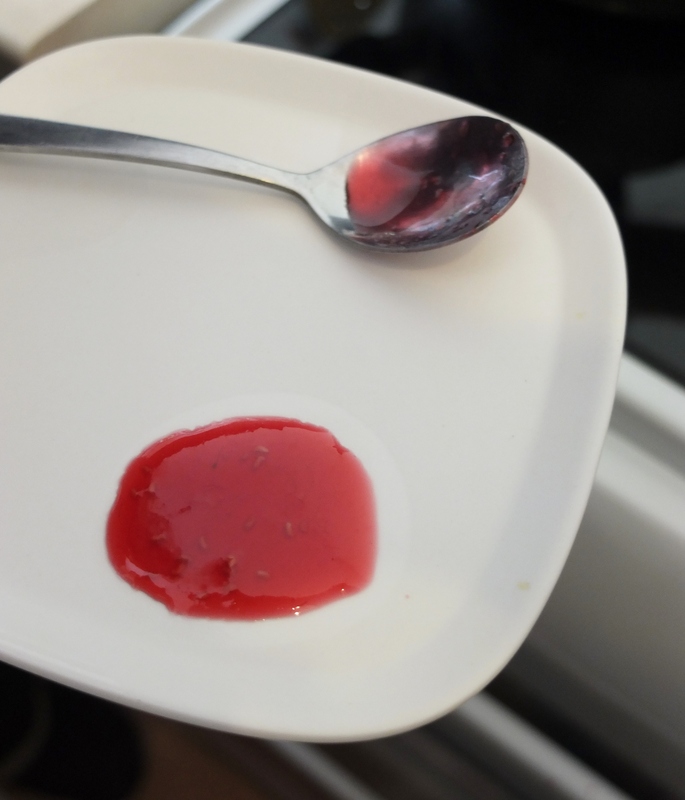 Take two or three spoonfuls of the seeds in the sieve to add back into the raspberry jelly to bring the weight up to around 200g. 2. Return the raspberries back to the saucepan and stir in the sugar. Heat gently so the sugar dissolves then boil rapidly for 5 minutes. 3. Test to see if ready. The jam should be at 104° Centigrade/219° Fahrenheit on a sugar thermometre. Or test by running your spoon through and it’s ready when the surface wrinkles as in the last photo. Also, get the little plate out of the freezer and place a drop on it. Let it cool a little. The surface should wrinkle when you run your finger through. Even if it doesn’t, it could be holding as a jelly and ready. Yay! 4. If not ready yet then boil for 2 more minutes and retest. Don’t overboil or you’ll get brown caramelised goo that loses that lovely colour and taste of fruit. Be careful when tasting it as jam can stay very very hot. 5. When ready pour into your jam jar or container. Let it cool and, ideally, set for 24 hours before using.